LED dance floors lighted dance floors for rent in the Atlanta Georgia area. We rent Tents, Tables, Chairs and party rental equipment. One stop shop for your party rental needs. Our L.E.D. Dance Floor is featured in Jennifer Anistons movie "Office Christmas Party". Add a touch of class to your VIP Event! Our LED dance floor rentals offer numerous color options. They are great for weddings, night clubs, dances, parties, model runways, conventions and even trade shows. Our LED floors illuminate the room and are fabulous when used with our other lighting options such as LED furniture and up lighting. Our LED illuminated lighted dance floor rentals are VERY popular and the best way to make your party the most memorable. We get reservations for our L.E.D. Dance floors months and even a year ahead of events. 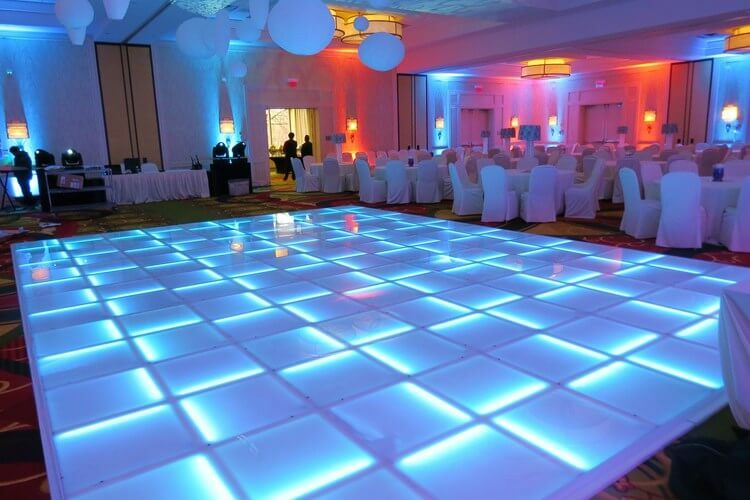 The LED dance floors can be programmed for specific colors or set to generate random colors. We can even light up the stage for your business event with the corporate colors. Our lighted dance floor rentals are able to be controlled by a wireless remote control. Our LED lighted dance floors can only be used indoors. We travel throughout the Southeast for our lighted dance floor rentals. Please call us to see if we will deliver in your area. Dance Floors are in Hi Demand for the Holidays.... Don't be disappointed... Reserve now!! !